"When will my family get their justice… if not from me?" IFC Films has released the full US trailer for the film Black 47, a gritty thriller set during the Great Irish Famine. This premiered at the Berlin Film Festival, but it got horrible reviews by most critics. Set in 1847, the film follows a hardened Irish Ranger fighting for the British Army who returns to his home, only to discover the famine has destroyed his country and left the people even more vile and ruthless than ever. With little else to live for, he sets a destructive path to avenge his family. James Frencheville (from Animal Kingdom) stars, with Hugo Weaving, Jim Broadbent, Stephen Rea, Freddie Fox, Barry Keoghan, Moe Dunford, Ciaran Grace, and Sarah Greene. I'd like to remind you this film is really bad, bland, forgettable. Thankfully we don't have to talk about it again. You can still watch the original UK trailer for Lance Daly's Black 47 here, to see a bit more footage. Set in Ireland during the Great Famine, the drama follows an Irish Ranger who has been fighting for the British Army abroad, as he abandons his post to reunite with his family. Despite experiencing the horrors of war, he is shocked by the famine's destruction of his homeland and the brutalization of his people and his family. 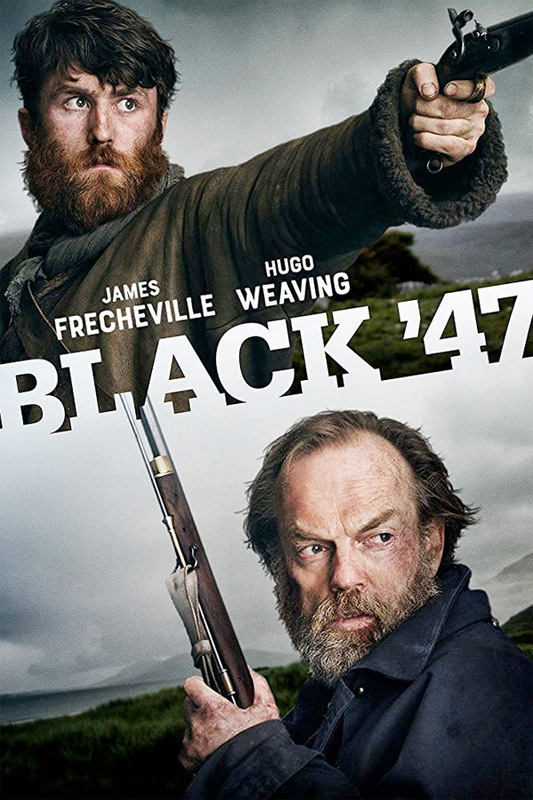 Black 47 is directed by Irish filmmaker Lance Daly, director of the films Last Days in Dublin, The Halo Effect, Kisses, The Good Doctor, and Life's a Breeze previously. The screenplay is written by Lance Daly, P.J. Dillon, and Pierce Ryan; based on a story by P.J. Dillon and Pierce Ryan. This first premiered at the Berlin Film Festival earlier this year, and also played at DIFF in Ireland. Daly's Black 47 will be released in the UK & Ireland this month. IFC will open Black 47 in select US theaters starting on September 28th.